One half of the PDR team celebrates a birthday today! So, let's all wish Saira a very "Happy Birthday!" and hope she gets to take some time out of bar studying to enjoy herself. Did we ever think something made out of paper could be this intricate and beautiful? Concarta features some gorgeous cake toppers that are carefully constructed out of paper, though you certainly wouldn't believe it at first glance. The attention to detail is amazing and we think these are a lovely, romantic, and modern twist on the traditional bride and groom cake topper. Those fond of Philly's Love Park will enjoy this cake topper. 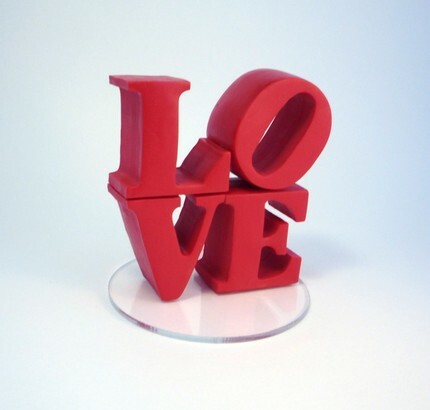 The topper is a replica of the Robert Indiana statue that stands in Philadelphia and many places around the globe. Art lovers, skate boarders, and modern couples everywhere would be thrilled to have this sculpture, by Blue Butterfly Design, adorn the top of their cake! Ok, seriously, how cute are these!? 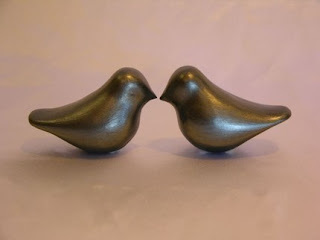 These pewter love birds, by sugarrushcakes, really take the cake! They are so simple and elegant and would be the perfect addition to any confectionery creation. Plus, we think these would look adorable on a shelf afterwards as a little decorative element. 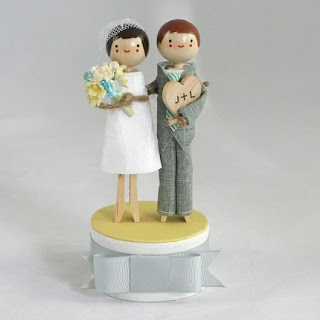 As far as wooden doll designs go, togetherforever's cake toppers are something to marvel at. The craftsmanship is top notch and the final result is nothing short of delightful. Complete with handmade clothing, childlike hand painted faces, and customized to your wedding color and style, these toppers are works of art that are irresistibly charming. You love your pets, so why not include them on your cake and portray yourselves as the happy family you are. 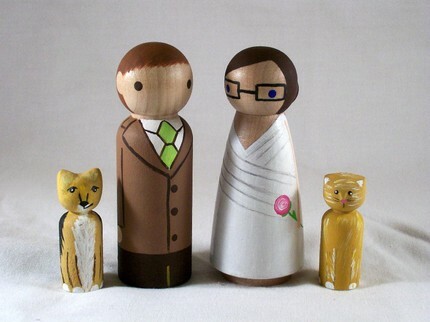 These toppers, by peanutbutterbandit, are hand painted and customized to resemble the bride and groom, and their cats! How fun! Plus, these wooden doll pieces are more affordable then some similar ones we have in this post, so it's a great option for you brides on a budget to get an adorable topper without sacrificing style! Love birds are some of our favorites and these, personified as the bride and groom, are modern and fun but still incredibly graceful. 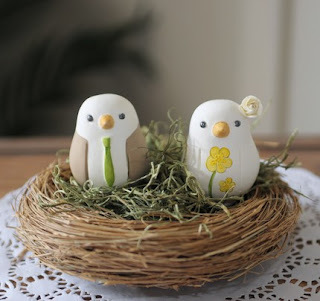 These birdies RedLightStudio are so cute and whimsical and can be customized to suite the bride and groom's style (check out that flower in the hair!) and colors. 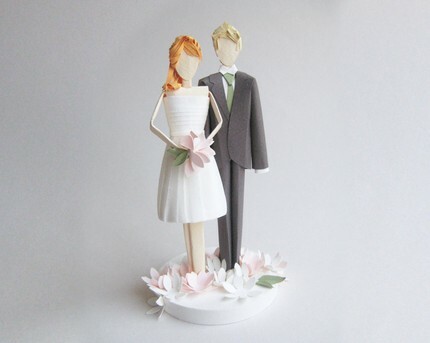 We think it's adorable when the cake topper really represents the couple well and this one certainly says a lot! 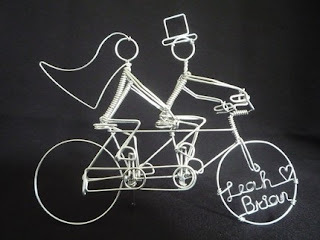 Bike enthusiasts everywhere will appreciate this tandem bike topper by etsy seller HeatherBoyd. This cycling couple is handmade using metal wire, and customized with the names of the bride and groom! How does it stand up, you ask? With a kickstand, of course!